High magick does seem to get quite comlicated with some of their rituals, and when you see things like the Opening or Closing by Watchtower, you may become very overwhelmed indeed! There is a reason for complexity in ritual…it helps us lose our sense of “self” by losing ourselves in the details and nuance of the ritual. So complexity keeps the conscious mind occupied with appropriate symbols, while the real magick of the ritual happens subconsciously. So the goal when doing a ritual is not to blindly follow some prescribed ritual, but rather to make sure the ritual is at the right level of complexity for our minds to lose ourselves in. If a spell or ritual is too complex, the opposite can occur, and one can become confused and frustrated–that is NOT a desired level of complexity, in which case the ritual should somehow be simplified. The goal is to have our rituals at just the right complexity level for our minds. This varies from person to person and even over the course of one’s magickal career. That’s why some people find Wiccan rituals too “simple” and others find them just right. 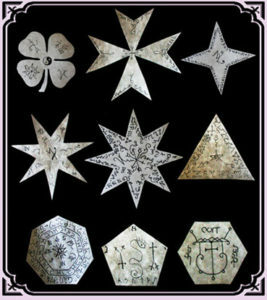 In Everything You Want To Know about Magick, I do give a wide range of spell options, from extremely simple spells that are like magickal aphorisms, through medium complexity talisman creation rituals, to complex high magick rituals. Throughout I try to encourage a student to adapt and adjust the rituals to one’s own level. So utlimately the right complexity for a ritual is one that allows you to lose yourself in the ritual, but not so much that you are completely overwhelmed and confused. And by the way, it is OKAY to use note cards when learning new rituals. You don’t have to have everything memorized to practice magick.